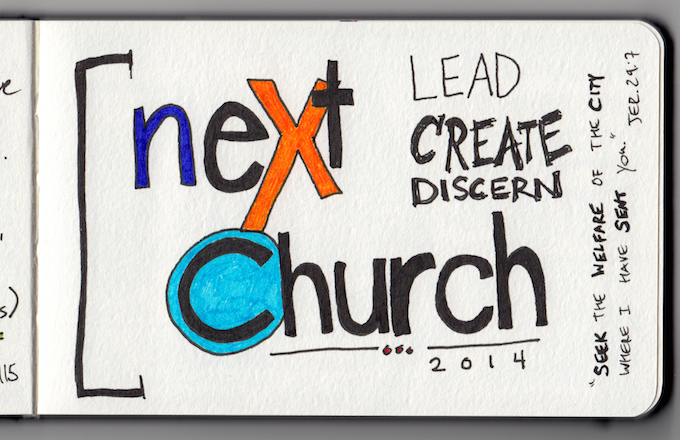 I wasn’t able to attend the 2014 NEXT Church National Gathering this year, but was very grateful for the parts of the event that were livestreamed. 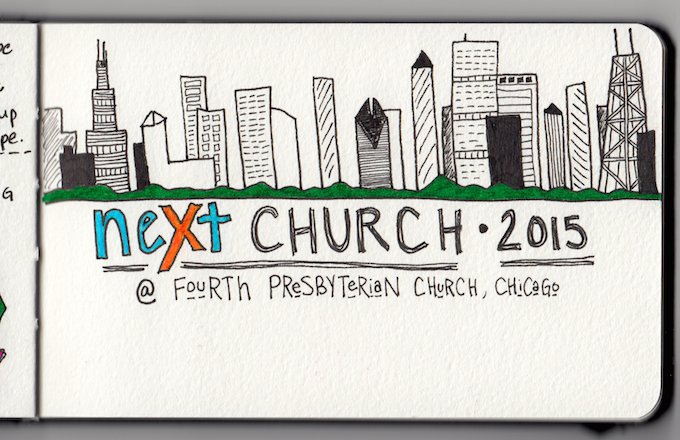 I was even more grateful when I heard that the 2015 National Gathering will be held in Chicago at Fourth Presbyterian Church, and I will definitely be there. 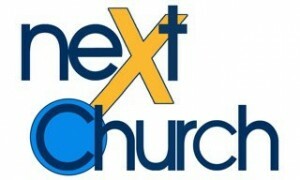 There were some great presentations, though I’m sure that some of the best stuff that happened at NEXT were the workshops, conversations over meals, and all of the relational parts of the event. It was fun to see some of my friends give some great presentations, including Erin Dunigan and her sharing about Not Church. 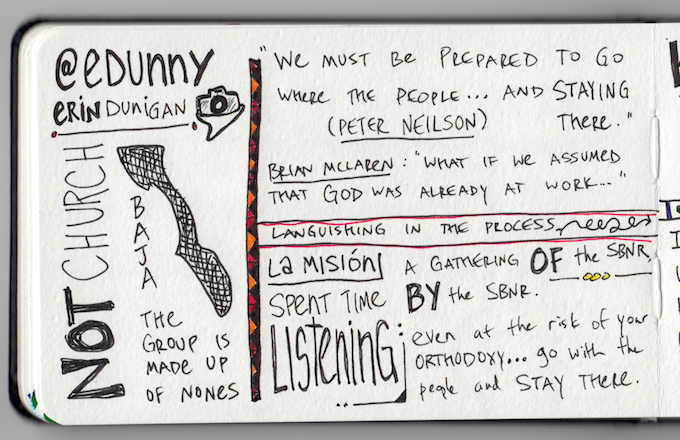 She shared a quote from Peter Neilson who said that “We [the church] must be prepared to go where the people are…and stay there.” She was reflecting on how many times we church folk create programs that are an attempt to reach people “where they are,” but there is often an assumption that they won’t stay there. 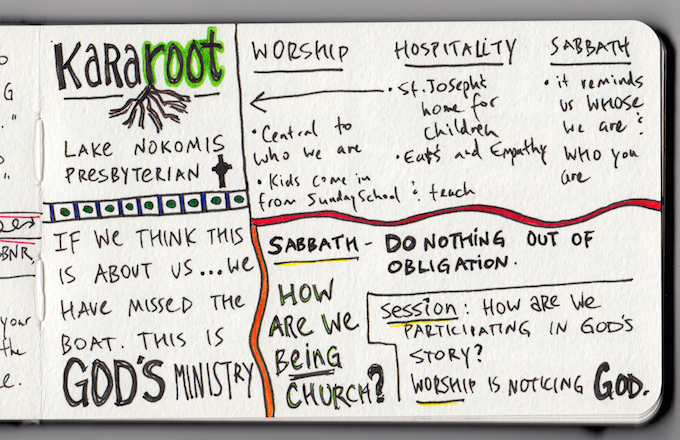 So, people talk about Theology Pubs that are successful, but then inevitably someone on the Session or Church Council will ask, “Well, that’s great…but when will they start attending worship?” (which is a really polite way of saying, “Well, that’s great…but when can we convert them into a giving unit?”). 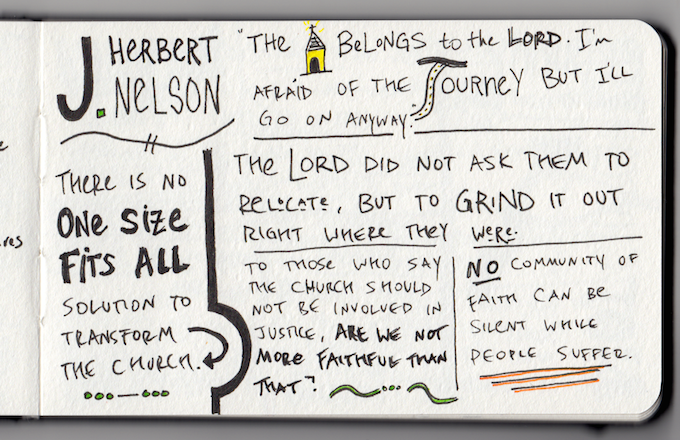 What a difference that is to think about going to where the people are…and staying there. That’s what Erin has done with Not Church, and I imagine that is going to be a lot of what the next church is going to look like. Now, how that equates with a job where one can provide for their family…I’m not sure. 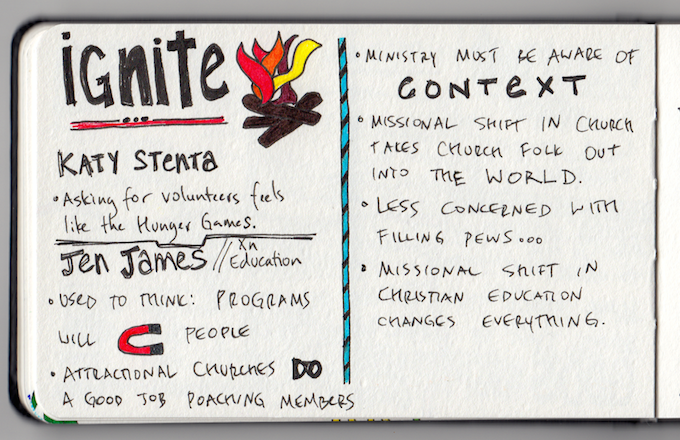 But I think we’re going to see more of this in the coming next church. 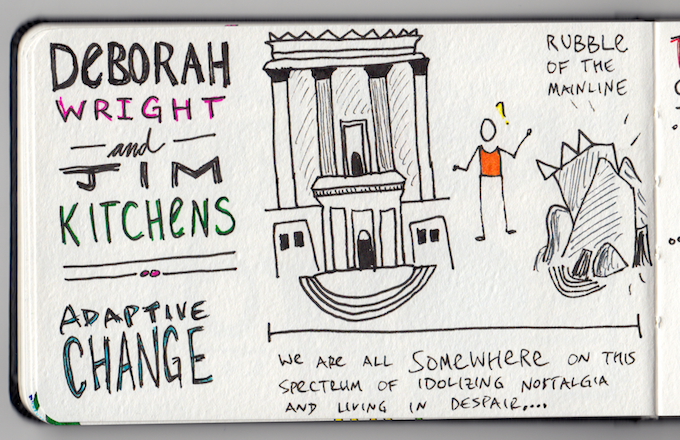 I was also struck by a comment during a presentation by Jim Kitchens and Deborah Wright, in which they critiqued the “best practices” model of change in church. 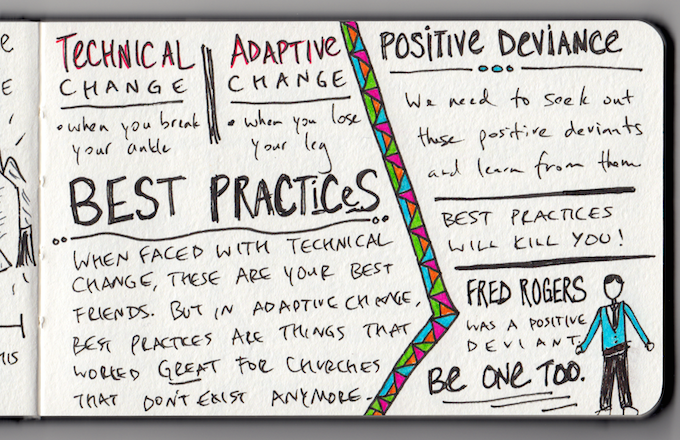 They said that when faced with adaptive change, best practices are things that worked great for churches that don’t exist anymore. 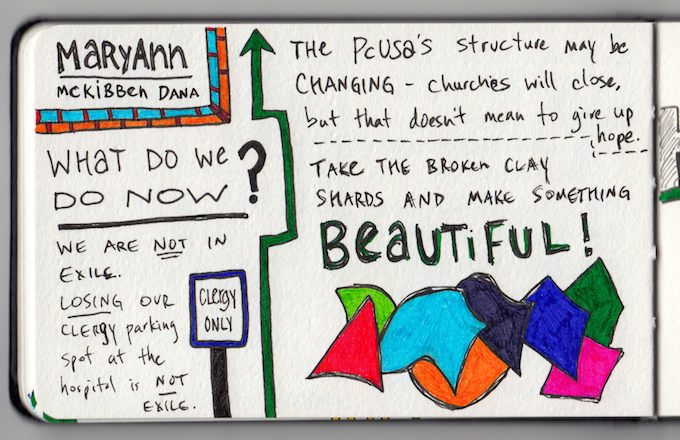 And a desire to find the best practices out there and mold them into your context…well, it just won’t work. 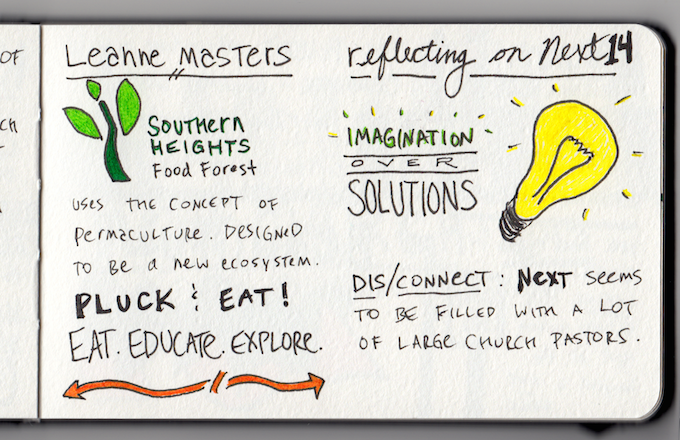 Below are some of the sketchnotes that I drew for the parts of the conference I was able to watch. 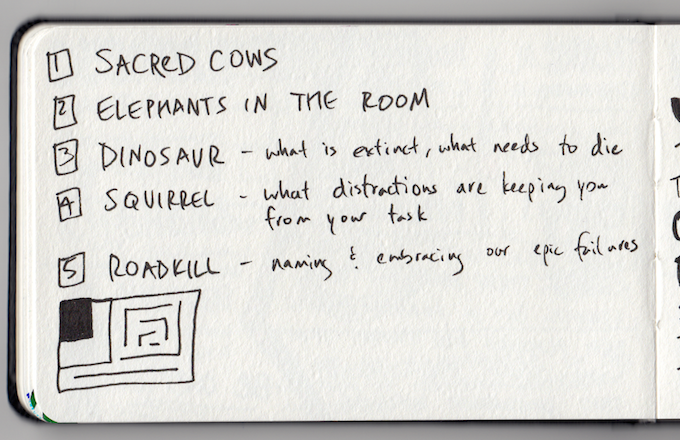 If you’d like to download a PDF packet of all the sketchnotes, you can do so here. Really love this. . . thanks for sharing.